Our organic BLUE-GREEN ALGAE is a remarkable deep blue in color, and when you drop just a little pinch in a glass of water, the entire glass turns bright blue. With nutrition I have learned to always eat a plate of food that has all the colors of the rainbow on it. This way you can assure yourself a broad-spectrum array of vitamins, minerals and nutrients. Although our blue-green algae are harvested from a lake, it comes from the only certified organic BLUE-GREEN ALGAE harvester available anywhere in the world. Being a northern American lake, our blue-green algae supplement is lower in beta-carotene than our Hawaiian grown spirulina, but it is much richer in Vitamin-B12 and other nutrients which makes it a great nutritional partner to the spirulina. 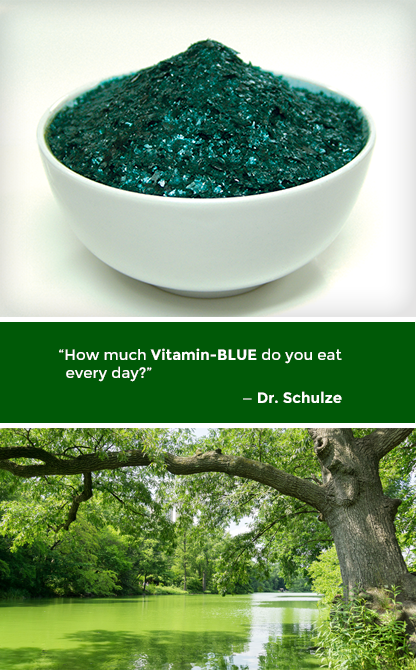 Just the blue-green algae, in one serving of Dr. Schulze’s SuperFood Plus, gives you 100% of the energy Vitamin-B12. This is one of the highest natural vegetarian sources of Vitamin-B12 that exists on the planet. It also contains all have the other B-vitamins and B-complex nutrients. It contains Vitamin-D, Vitamin-E and is an extremely rich source of Vitamin-K, your anti-hemorrhage vitamin, supplying you with over 20% of what you need each day. All algae are rich sources of minerals and blue-green algae is no exception; containing boron, calcium, chlorine, chromium, copper, fluorine, germanium, iodine, iron, magnesium, manganese, molybdenum, nickel, phosphorus, potassium, selenium, silicon, sodium, titanium, vanadium and zinc. It is also rich in carotenoids, chlorophyll and C-phycocyanin. It contains the very important Essential Fatty Acids (EFA’s) of Omega-3 alpha linolenic, Omega-3 eicosapentanoic and Omega-3 docosahexaenoic plus Omega-6 linoleic, plus oleic, palmitoleic, stearic, eicosatrienoic, myristic, margaric, margaroleic, myristoleic, eicosadienoic, arachidonic. eicosanoic, tridecenoic, pentadecenoic, gadoleic, euricic, nervonic, capric, lauric, heneicosanoic, pentadecanoic, palmitic, nonadecanoic, behenic, lignoceric and docosadienoic heptadecanoic and tridecanoic fatty acids. Being a protein food, it is also very rich in amino acids containing arginine, histidine, isoleucine, leucine, lysine, methionine, phenylalanine, threonine, tryptophan, valine, alanina, asparagine, aspartic acid, cystine, glutamine acid, glycine, proline, serine and tyrosine.